While engaged with Indians concealed in a ravine, Sergeant McMillan assisted the men on the skirmish line, directed their fire, encouraged them by example, and used every effort to dislodge the enemy. Sergeant Albert W. McMillan had been in the Army and the 7th Cavalry for little more than three years when his troop departed Fort Riley for the Sioux Campaign of 1890-1891. Despite his limited experience in the military, he was serving as one of four sergeants in Captain Ilsley’s E Troop at Wounded Knee. Moreover, McMillan’s bravery in battle, his education, and his leadership qualities brought him greater responsibility following that day’s conflict. The regiment’s sergeant major, Richard W. Corwine, was killed at Wounded Knee, and Colonel Forsyth saw fit to recommend to the adjutant general of the Army that McMillan, fill the vacancy. The twenty-eight-year-old Princeton educated senator’s son became the 7th Cavalry’s senior non-commissioned officer on 31 December 1890, the day the regiment laid to rest thirty of its fallen troopers. 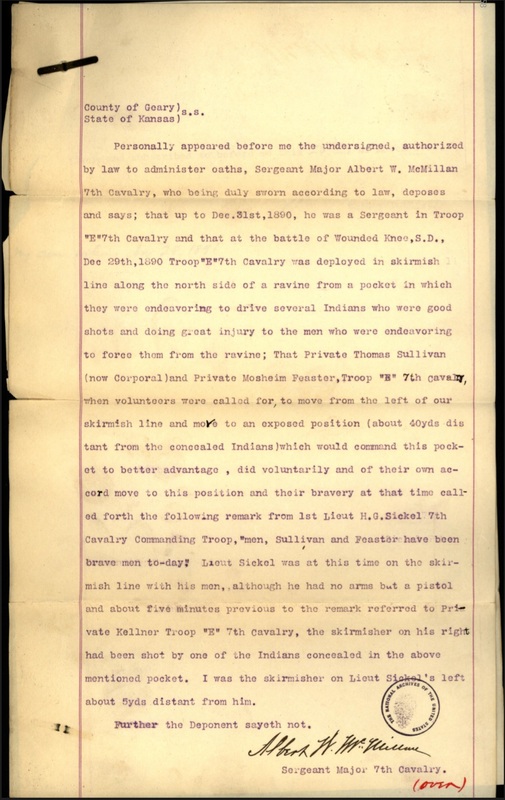 (Click to enlarge) Sergeant Major Albert W.McMillan provided a deposition on 26 March 1891 detailing the bravery of Privates Sullivan and Feaster and describing his own role during the battle. A number of soldiers’ actions on 29 December, particularly regarding dislodging Indians from the ravine, caught the attention of the officers of E Troop, especially two privates, Mosheim Feaster and Thomas Sullivan. On 26 March Sergeant Major McMillan and Sergeant William G. Austin, both of E Troop during the battle, provided depositions regarding the conduct of Sullivan and Feaster. On 17 and 18 April 1891 First Lieutenant Horatio G. Sickel and Second Lieutenant Sedgwick Rice wrote recommendations not only for Sullivan and Feaster, but for three of their non-commissioned officers as well, including Sergeant Major McMillan. Four of the five requests were returned by the War Department on 6 April requesting that Colonel Forsyth and Captain Ilsley provide endorsements, as the former was on leave and the latter on detached service when the original requests were processed. 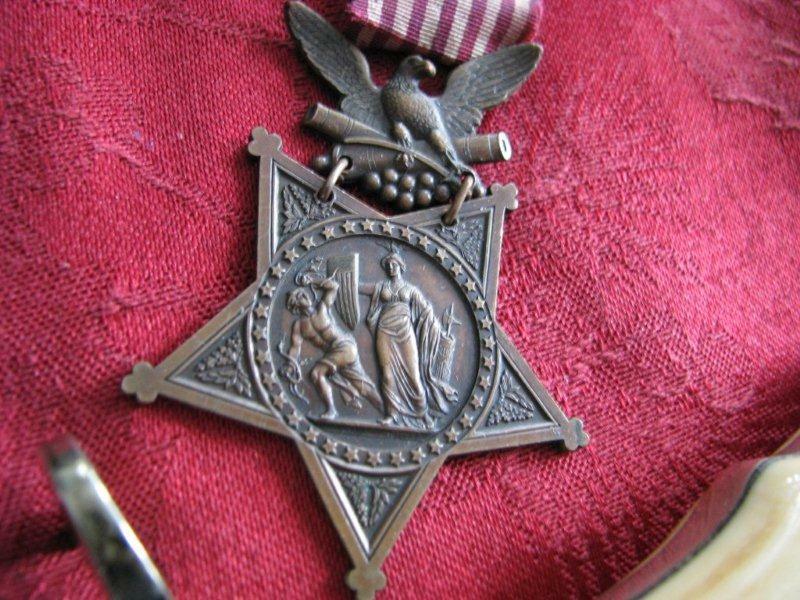 Curiously, five days after Sickel recommended that McMillan be awarded a Medal of Honor, the regiment’s sergeant major voluntarily requested that he be reduced to the rank of private. In the frontier Army, non-commissioned officer promotions–for all ranks–were approved at the War Department based on the recommendation of a unit’s commander. Similarly, rank could be taken from a non-commissioned officer through a court martial, or based on the soldier’s own request. E Troop’s First Sergeant Charles M. Clark, was recommended to replace McMillan as the regiment’s sergeant major, and McMillan reverted to the rank of private. Regardless of McMillan’s request for reduction, on 5 May Captain Ilsley and Colonel Forsyth endorsed Sickel’s recommendation for a medal. The department commander, Brigadier General Wesley Merritt, forwarded the request on to the adjutant general with no endorsement, presumably because he played no role in the previous winter’s campaign. The adjutant general’s office prepared the following summation and forwarded it to the commanding general of the Army, Major General John M. Schofield, who recommended approval. (Click to enlarge) Troop E being engaged, dismounted, with Indians concealed in a ravine, McMillan, by his coolness and bravery attracted the attention of his troop commander, rendering him much assistance by placing the men on the skirmish line in good positions, directing their fire and encouraging them by good example; he frequently exposed himself to close fire from the ravine in order to obtain an advantage over the concealed Indians and made every effort to dislodge them. The assistant secretary of war, Lewis A. Grant, endorsed the recommendation writing “Let the medal of honor be issued.” McMillan was awarded the medal on 23 June. Born on 13 October 1862 at Stillwater, Minnesota, Albert Walter and his twin brother, Thomas Erskine, were the third and fourth sons of Judge Samuel James Renwick McMillan and Harriet Elizabeth Butler. Samuel McMillan was a lawyer and native of Brownsville, Pennsylvania, the son of Thomas Long and Jane (Gormly) McMillan. After graduating from Duquesne College in 1846, Samuel began practicing law in Pittsburgh where he met and married Harriet Butler in 1850. She was the daughter of John Bartlett and Catherine Selina (Gazzam) Butler. They had nine children in all. The eldest was Mrs. Katherine Gazzam Beals, born in 1851 and died in 1939. A son, Austin Loomis was born in 1855 but died two years later. A second daughter, Mrs. Anna Walter Shepard, was born in 1856 and died in 1944. Joseph Butler was born in 1858 and died in 1947. Mrs. Jessie Gormly Seely was born in 1860 and died in 1947. Twin boys, Albert Walter—the subject of this post—and Thomas Erskine were born in 1862; Thomas died four years later, and Albert outlived all of his siblings, dying in 1948. Samuel Renwick was born in 1868 and died in 1910, and another son, John Butler was born in the 1860s and died as an infant. At the time of Albert’s birth his father was serving as the judge of Minnesota’s first judicial district, a position he held until 1864. Judge McMillan did not serve in the military during the Civil War, but at the same time during the Minnesota Indian War of 1862 he did serve for about three weeks as a second lieutenant in the Stillwater Frontier Guards. The company sized unit participated in the uneventful Chengwatana Expedition departing from Stillwater at the end of August with the purpose of preventing the Chippewa from joining the Sioux uprising. In 1864 Judge McMillan was appointed an associate justice of the Minnesota Supreme Court and was subsequently reelected until 1874 when he was appointed chief justice of the same bench. Running as a republican, Judge McMillan was elected to the U.S. Senate in 1875 serving his state in that capacity for twelve years. He returned to St. Paul in 1887 and practiced law until his death in 1897. His widow survived him by twenty years. (Click to enlarge) Sergeant Major Albert W. McMillan was reduced to the rank of Private at his own request in April 1891. McMillan’s travels west saw him enlist in the Army at Jefferson Barracks, Missouri, on 15 August 1887, five months after his father left the U.S. Senate. The twenty-four-year-old native Minnesotan listed his age as twenty-five, his birth place as Baltimore, Maryland, his profession that of a school teacher, and was recorded as having blue eyes, brown hair, a fair complexion, and standing just under five feet, ten inches in height. McMillan was assigned as a private in Captain Ilsley’s E Troop, 7th Cavalry where the young man’s intelligence and drive saw him quickly rise to the rank of sergeant in his troop and later, sergeant major of his regiment. After McMillan requested that he be reduced to the rank of private, and just prior to receiving the Medal of Honor, the Princeton educated trooper was assigned to G Troop, then F Troop, before ending up again in E Troop. Private McMillan pled guilty to all charges at his court martial in April 1892. It was in the spring of 1892 that Private Albert McMillan ran afoul of civil and military justice. On Saturday morning, 9 April 1892, McMillan, drunk and in civilian attire, staggered into the streets of Junction City, Kansas, where he verbally accosted a woman. He was arrested, tried, convicted, and jailed for three days by civil authorities for “using vile and insulting language to a lady.” While in confinement, he was carried as absent without leave from his unit, and, following his release and return to Fort Riley on 15 April, he faced a general court martial. The Army charged him with being absent without leave and of conduct that was prejudicial to good order and military discipline. He pled guilty to all charges and specifications and the court sentenced him to three months confinement at hard labor and ten dollars a month for the same period. The convening authority for the trial was the department commander, Major General Nelson A. Miles, who reduced the sentence to fifteen days bringing it in line with punishments prescribed in general orders of the day. Private McMillan’s five year enlistment should have ended in the middle of August 1892, but he was continued in the service until 21 September to “make good time” for the period in which he was in confinement and while absent without leave. 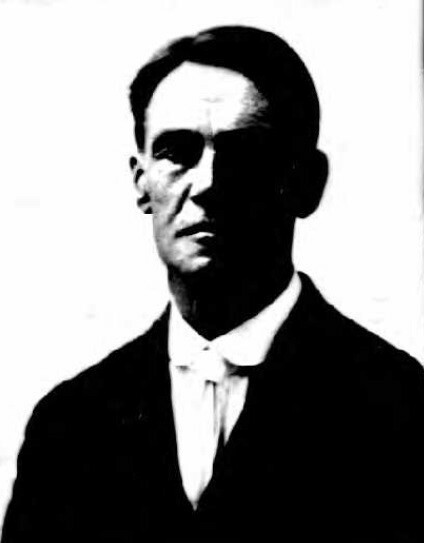 Albert McMillan’s passport photograph from 1918 is perhaps the only image of this Medal of Honor recipient. McMillan returned to St. Paul, Minnesota, and entered the University of Minnesota where he earned a bachelor’s of law degree in 1894. He worked for a time as the legal editor for the West Publishing Company. While thus employed McMillan suffered a breakdown, or “nervous prostration” in the vernacular of the day. Before the close of the decade he moved to Blaine, Washington, and eventually to Brawley, California. Perhaps suffering from the effects of his nervous breakdown, intemperate use of alcohol, or even what today we would call Post Traumatic Stress Disorder, McMillan seems to have fallen on hard times and never recovered. He worked variously as a hired man, teamster, farmer, and truck driver. During World War I, he served with the American Red Cross traveling to England in September 1918 in that capacity. Following the war, he returned to Los Angeles and eventually retired in Sacramento, California, never having married. 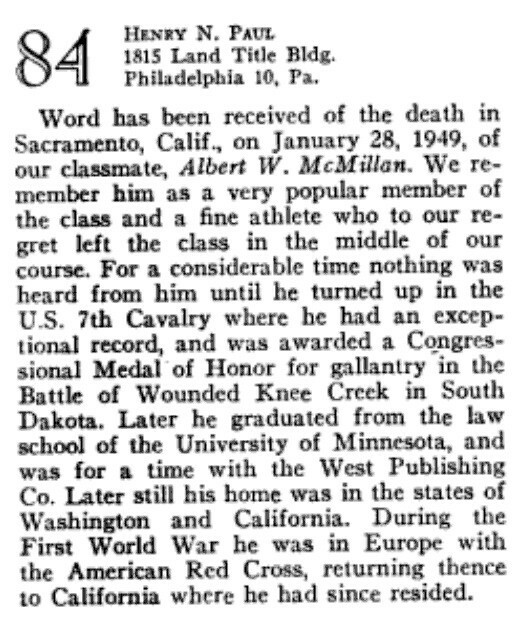 Albert W. McMillan’s death announcement ran in the February 1949 Princeton Alumni Weekly. Despite attempts by his Princeton classmates to find their former class president, McMillan remained lost to them for decades. Albert Walter McMillan died in Sacramento on 2 October 1948, eleven days shy of his eighty-sixth birthday. His body was returned to St. Paul where he was buried in a plot adjacent to his father. Three months later, word of the Medal of Honor recipient’s death reached Princeton classmate Henry N. Paul who posted it in the class notes of the alumni weekly. 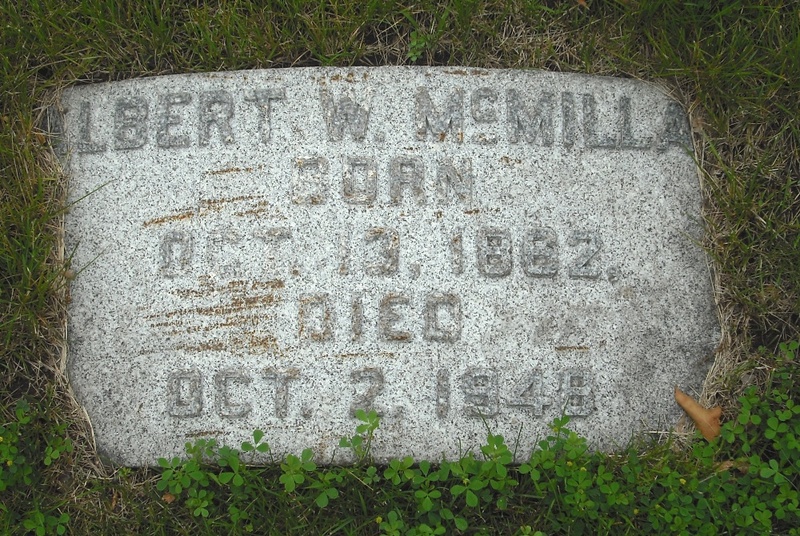 Albert Walter McMillan is buried in the Oakland Cemetery in Saint Paul, Minnesota in a plot adjacent to his father, Senator S. J. R. McMillan. Samuel L. Russell, “E Troop, 7th Cavalry Regiment Muster Roll,” Army at Wounded Knee, posted 17 Sep 2014, accessed 29 Oct 2014, http://wp.me/p3NoJy-xu. Ibid. ; National Archives and Records Administration (NARA); Washington, D.C.; Returns from U.S. Military Posts, 1800-1916, Microfilm Serial: M617, Microfilm Roll: 1014, Military Place: Fort Riley Reservation, Kansas Territory, Return Period: Mar 1891. 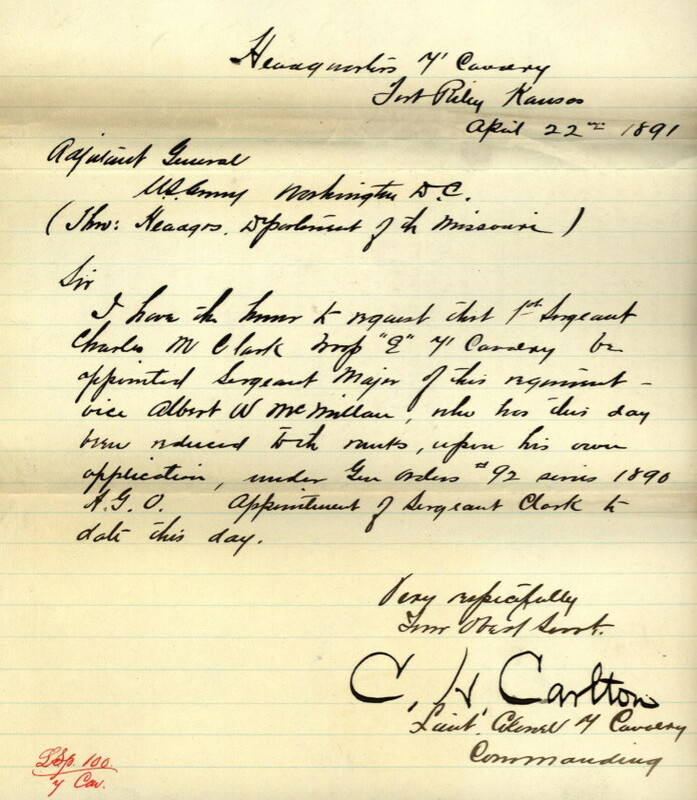 Medal of Honor file for Albert McMillan; C. H. Carlton to Adjutant General’s Office dated 22 April 1891, Source data: The National Archives, Principal Record Division, file 6776, Record Group: 94, Stack area: 8W3, Row: 7, Compartment 30, Shelf: 3. Adjutant General’s Office, Medal of Honor file for Albert McMillan. Minnesota Historical Society, Collections of the Minnesota Historical Society, vol. 8 (St. Paul: Minnesota Historical Society, 1898), 526; Ancestry.com, United States Federal Census [database on-line], Provo, UT, USA: Ancestry.com Operations, Inc., 2009, Year: 1850, Census Place: Allegheny Ward 3, Allegheny, Pennsylvania, Roll: M432_744, Page: 166A, Image: 337; Year: 1860, Census Place: Stillwater, Washington, Minnesota, Roll: M653_576, Page: 527, Image: 125, Family History Library Film: 803576; Year: 1870, Census Place: St Paul Ward 4, Ramsey, Minnesota, Roll: T132_10, Page: 1288, Image: 152, Family History Library Film: 830430; Ancestry.com, Minnesota, Territorial and State Censuses, 1849-1905 [database on-line], Provo, UT, USA: Ancestry.com Operations Inc, 2007. Andrew R. Dodge, Betty K. Koed, United States Congress, Biographical Directory of the United States Congress, 1774-2005 (Washington: Government Printing Office, 2005), 1562; Elijah E. Edwards, ed., William H. C. Folsom, cont., Fifty Years in the Northwest: With an Introduction and Appendix Containing Reminiscences, Incidents and Notes (Minnesota: Pioneer Press, 1888), 426; Ancestry.com, Washington, Select Death Certificates, 1907-1960 [database on-line], Provo, UT, USA: Ancestry.com Operations, Inc., 2014; Ancestry.com, United States Federal Census, Year: 1880, Census Place: Saint Paul, Ramsey, Minnesota, Roll: 630, Family History Film: 1254630, Page: 259D, Enumeration District: 013, Image: 0520; Year: 1910, Census Place: St Paul Ward 7, Ramsey, Minnesota, Roll: T624_720, Page: 4B, Enumeration District: 0090, FHL microfilm: 1374733; Year: 1920, Census Place: St Paul Ward 7, Ramsey, Minnesota, Roll: T625_853, Page: 1A, Enumeration District: 153, Image: 1062; Ancestry.com, Minnesota, Death Index, 1908-2002 [database on-line], Provo, UT, USA: Ancestry.com Operations Inc, 2001, Certificate Year: 1922, Record Number: 349696. Ancestry.com, U.S. School Yearbooks, 1880-2012 [database on-line], Provo, UT, USA: Ancestry.com Operations, Inc., 2010, Year: 1883, Yearbook Title: Bric A Brac; Ancestry.com, US, Register of Civil, Military, and Naval Service, 1863-1959 [database on-line], Provo, UT, USA: Ancestry.com Operations, Inc., 2014, Year: 1883, Title: Official Register of the United States, Containing a List of Officers and Employees in the Civil, Military, and Naval Service, Volume: Volume 1; Princeton Alumni Weekly, The Medal of Honor, http://paw.princeton.edu/issues/2010/11/03/pages/4941/index.xml?page=2 accessed 12 Jul 2013. Ancestry.com, U.S. Army, Register of Enlistments, 1798-1914 [database on-line], Provo, UT, USA: Ancestry.com Operations Inc, 2007. 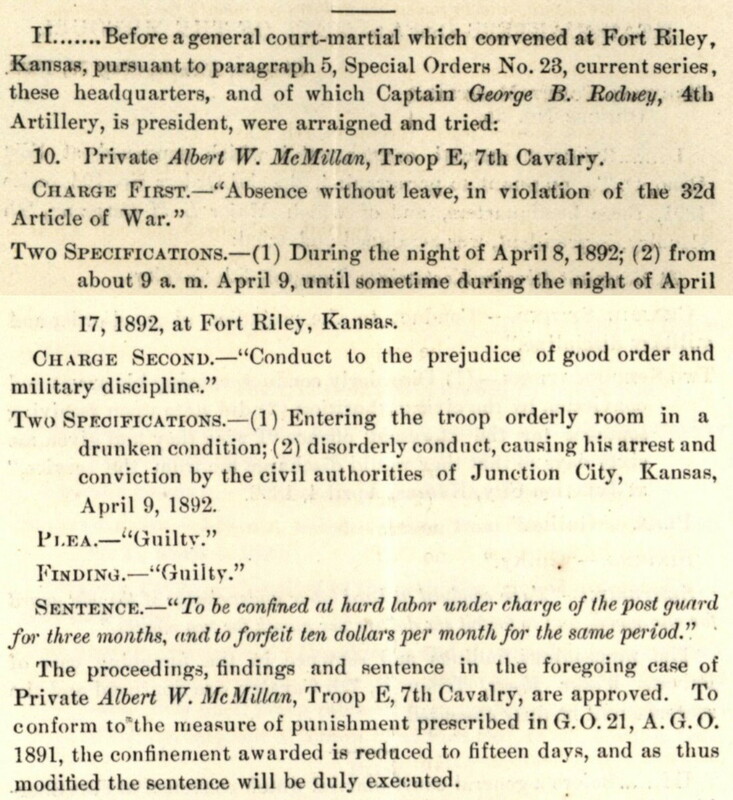 Adjutant General’s Office, “Albert W. McMillan, Private, Troop E, 7th Cavalry, Tried by General Court Martial at Fort Riley, Kansas, April 26th, 1892,” Source data: The National Archives, Record Group: 153, Stack area: 7E3, Row: 15, Compartment 28, Shelf: 1. Ancestry.com, U.S. City Directories, 1821-1989 [database on-line], Provo, UT, USA: Ancestry.com Operations, Inc., 2011; Ancestry.com, United States Federal Census, Year: 1910, Census Place: Brawley, Imperial, California, Roll: T624_77, Page: 2A, Enumeration District: 0003, FHL microfilm: 1374090; Year: 1930, Census Place: Long Beach, Los Angeles, California, Roll: 129, Page: 9B, Enumeration District: 1072, Image: 131.0, FHL microfilm: 2339864; Year: 1940, Census Place: Sacramento, Sacramento, California, Roll: T627_284, Page: 5A, Enumeration District: 34-97; Ancestry.com, UK, Incoming Passenger Lists, 1878-1960 [database on-line], Provo, UT, USA: Ancestry.com Operations Inc, 2008, Class: BT26; Piece: 646; Item: 4. 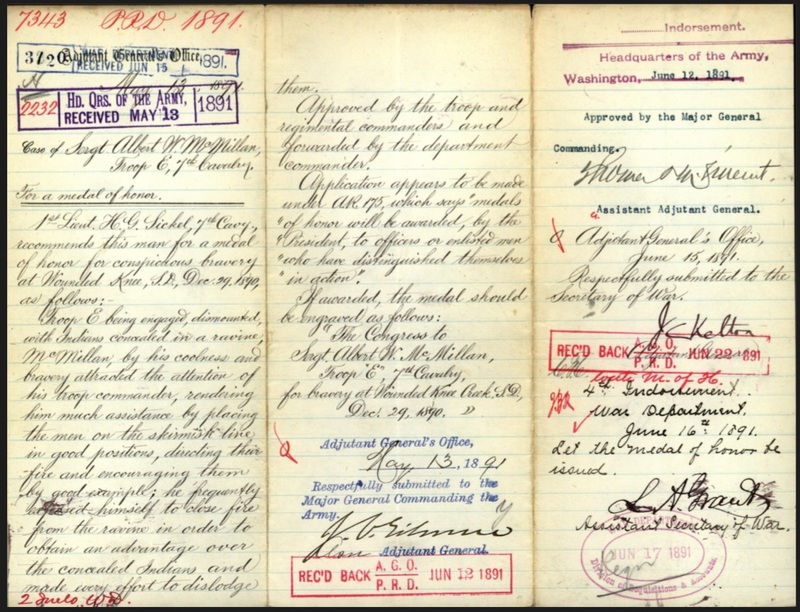 National Archives and Records Administration (NARA), Washington D.C., NARA Series: Passport Applications, January 2, 1906 – March 31, 1925, Roll #: 565, Volume #: Roll 0565 – Certificates: 29550-29749, 05 Aug 1918-08 Aug 1918. Ancestry.com, California, Death Index, 1940-1997 [database on-line], Provo, UT, USA: Ancestry.com Operations Inc, 2000, Place: Sacramento; Date: 2 Oct 1948; Henry N. Paul, “Class Notes.” Princeton Alumni Weekly, Feb 25, 1949: 10. Christina, photo., “Albert Walter McMillan,” FindAGrave, http://www.findagrave.com/cgi-bin/fg.cgi?page=gr&GRid=7915499 accessed 13 Oct 2013. Citation for article: Samuel L. Russell, “Sergeant Albert Walter McMillan, E Troop, 7th Cavalry – Conspicuous Gallantry,” Army at Wounded Knee (Sumter, SC: Russell Martial Research, 2013-2015, http://wp.me/p3NoJy-d4), updated 7 Dec 2014, accessed date _________. This entry was posted in Award Recipients, Enlisted and tagged 7th Cavalry, 7th Cavalry Regiment (United States), Battle of Wounded Knee, Cavalry, Fort Riley, Medal of Honor, Sergeant Major, White Clay Creek, Wounded Knee, Wounded Knee Creek, Wounded Knee Massacre. Bookmark the permalink.